I’ve not been one to daily or weekly blog, maybe one day, but when I saw that I hadn’t put anything here since January of 2013 my own dropped. Life does intervene in many ways that do not lend themselves to all aspects of an artist’s life and I suppose that is what has been happening here. I am still here however and so happily blessed to have the support of my wonderful collectors, my trusted gallery reps and friends and family who keep me grounded. 2013 was what I would call a challenging time. In retrospect the ups were sweet and the downs trying. The passing of my dear dad at just shy of 96 was bittersweet. I am finding myself talking with him every day – he’s so much more accessible now that he is solidly in my heart and mind, not 700 miles away from me. I’ll write more about him later. I’ve lots to write about so maybe this year will be the year of the weekly blog for me. I have a backlog of essays in my swimming brain on issues such as a recent award from Pastel Journal Magazine, inclusion in a coffee table book by E. Ashley Rooney, arts advocacy, dealing with galleries, staying hopeful while physically impaired and the journey through the second half of my life as an artist. For now its about a current show at Robert Allen – one of my favorite art dealers and gallery owners I’ve ever had the privilege of working with. 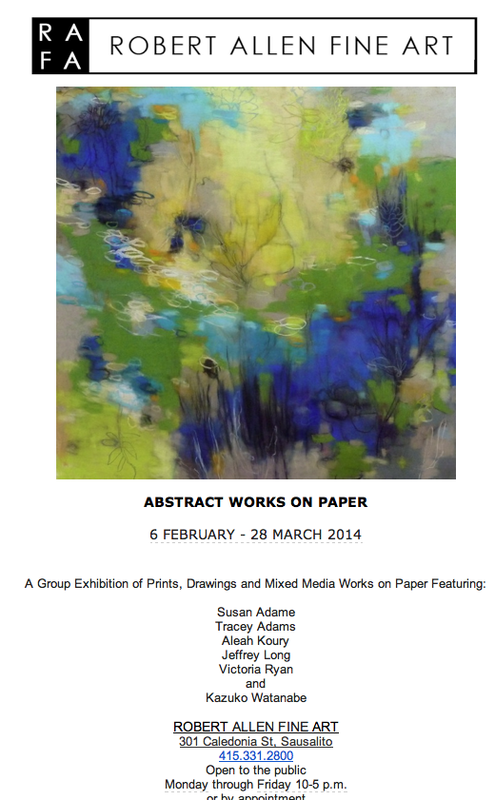 I have a selection of abstract pastels in a group show there through March. Robert has a beautiful gallery there – slightly off the main track where most tourists devote time. He is also an approachable, personable guy who believes deeply in his artists. If you are in Sausalito, his gallery is a must!